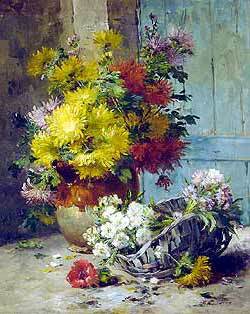 The oeuvre of Eugène-Henri Cauchois, as is represented today, is unique in that modern-day viewers will most commonly only become familiar with his decorative still lifes of fresh flowers, painted in a swift manner bordering on Impressionism. But this over-abundance of only these images belies his nature as a more diverse artist, one who, in the beginning of his career, showed an understanding of previous artistic movements such as Romanticism. 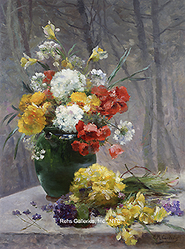 While his still lifes continue the representation of this type of art, singular in itself, discovery of Cauchois’ work outside of his flower paintings will usher in a new understanding of his work. 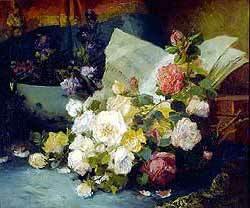 Eugène-Henri Cauchois was born on February 14, 1850 in Rouen, a city in the Normandy region of western France. 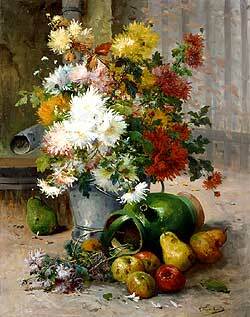 In pursuance of an artistic career, he first began studying under Ferdinand Duboc. 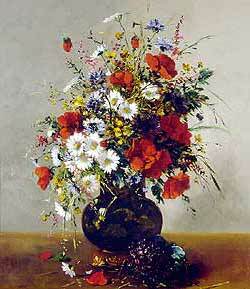 Cauchois debuted at the Salon of 1874 with Un Lapin (A Rabbit) beside which was placed a text by Victor Hugo which read, “Behold the unfortunate, recumbent, naked, miserable [animal], all covered with blood, redder than maple, during the flower season.” His placement of this quote next to his picture suggests that Cauchois was a supporter of the Romanticist movement, interesting in that he was working during a period in which Romanticism in painting had passed and new movements such as Impression were gaining momentum. He followed his debut the following year with two other works, the first of which again shows his fairly unique inclusion of another quote to situate his work at a higher level of interpretation. Horloges et Pendules (Large Clock and Small Clock/Pendulums) carried a quote by Alexandre Théodore Dézamy, a nineteenth century writer, which read, “Oh clocks of our grandmothers, You whose Love was the clockmaker, Forget the bitter hours, To ring the hour of the shepherd.” His second work, Fleurs et Fruits (Flowers and Fruit) is his first exhibited flower still life, a compositional type for which he would truly establish his reputation, at least in modern times. By 1876, Cauchois had partially relocated to Asnières along the Seine, just outside of Paris. The same year he exhibited just one work, Avant l’Étalage (In front of the Display). 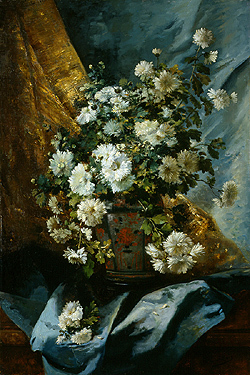 Between 1878 and 1879 Cauchois took up residence in Brussels as well as Paris and exhibited two paintings at the, Fleurs (Flowers) and La Pièce de la Resistance (The Principal Dish). He remained in Brussels until at least 1883 and, at some point between 1883 and 1887, returned to Paris after spending nearly four years in Brussels. It cannot be estimated, however, to what point his time spent in Brussels influenced his work, since the whereabouts of much of his work is unknown. 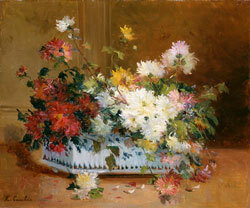 What does remain of Cauchois’ work at present, and what he is most remembered for, are his flower arrangements, many often painted in a series of decorative panels meant to be seen side by side. Perhaps Cauchois was inspired by the vertical compositions and love of nature of Japanese paintings, since much of this period saw an increase in the appreciation in Japonisme and many artists began experimenting with new compositional formulas. 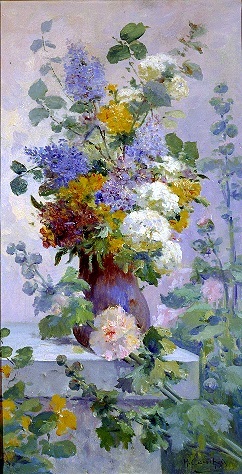 While the majority of Cauchois’ work which can now be found and purchased are his floral paintings, most of his Salon entries differ quite substantially in theme from these images. Some of these exhibited works suggest the diversity of his production, including: Une Collision près le Manneken-Pis (A Collision near the Manneken-Pis), Salon of 1880; Église Abandonnée à Mézières (Abandoned Church at Mézières), Salon of 1888; and La Toussaint en Croatie (All Saint’s Day in Croatia), Salon of 1895. 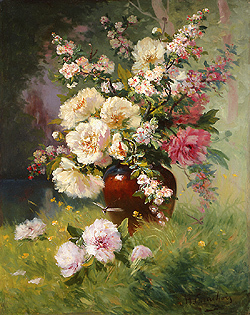 It seems as if Cauchois’ more experimental work was exhibited at the Salons, while his other work, especially that of flower paintings, found a wide audience among collectors both during the late nineteenth century and into the twenty-first century. 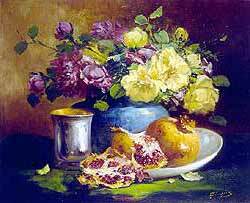 Still lifes had been a long traditional subject throughout Europe and France was no exception. 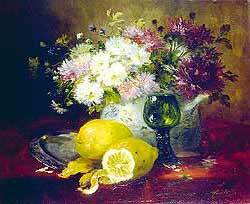 Even into the late nineteenth and early twentieth century, modern artists such as Édouard Manet and Vincent Van Gogh began working with still lifes, many of flowers. Cauchois’ soft, colorful and lustrous still lifes reflect a strong influence from the great Impressionist artists of his time. Similar to the Impressionists, his canvases are painted layer upon layer with loose and fluid brush strokes. In the mid 1890’s Cauchois also began studying under Alexandre Cabanel, one of the most successful academic artists of the period, in addition to Duboc, and by 1899 he had taken on a third teacher, Ernest Quost. Cauchois also began to work more and more on decorative panels, just as Quost did, and received several commis­sions for these larger works, such as that of four decorative panels representing flowers of the four seasons for the School of the 7th district in Paris. Cauchois continued to exhibit regularly at the Salons until 1908, where he showed Le Train a Passé (The Train Has Passed By) and Mélancolie (Melancholy). He received several recompenses throughout his career including: Medal of Honor, 1891; third-class medal, 1898; bronze medal, Exposition Universelle, 1900; a second-class medal, 1904 and in 1906 he was deemed “hors concours,” granting him automatic admission into the Salon. He had also become a member of the Société des Artistes Français. Cauchois died on October 11, 1911 in Paris. 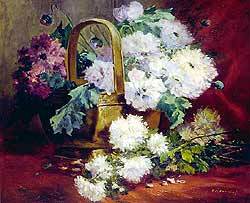 At present, what we know best about Eugène-Henri Cauchois is his flower paintings, but it should be taken into account that while much of his work has yet to be located, his themes extended beyond that of flower painting. 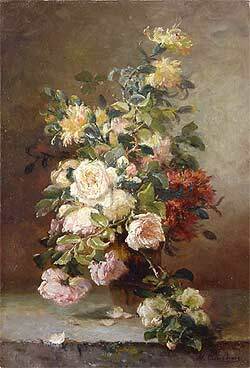 Nonetheless, the remarkable extent to which his flower paintings remain popular today speak to the continued acceptance of still life and flower painting as a popular form of decorative art.